Paul Malone (right) has moved from Corby to Peterborough Sports. Peterborough Sports boss Jimmy Dean is expecting a strong push for the play-offs next season. The city side appear to have recruited well so far in the summer as they prepare for a second season at Evo Stik League level. Highly regarded centre-back Paul Malone has arrived from Corby, while Jake Newman (Kempston), Jordan Brown (Eynesbury), Mitch Griffiths (Holbeach) and Ronayne Marsh-Brown (St Neots) have all committed to a season at PSL. Last term Sports finished 12th in Division One South of the Northern Premier League. For the 2018-19 campaign Sports will play in Division One East of the Southern League which is generally seen as a weaker division. “I think the top teams will be as strong as the best sides we faced last season,” Dean stated. “But the lesser teams will probably be a bit weaker. 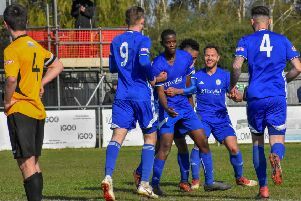 “We will be competing against Bromsgrove who play in front of 800 fans most home games and we meet Cambridge City who are a big name at our level. Bedford are apparently having a real go next season as well, while Corby are always competitive. “But I fancy us to go well. From February onwards last season we showed top three/four form and next season I want us to have a real go at reaching the play-offs. “That means chasing a top five place. I’m not saying we will be good enough to get there, but I want us to at least challenge the top sides. “The squad is developing nicely. Paul Malone is a strong player at this level, I really rate Mitch Griffiths and if Jordan Brown can make the step up he will be a decent signing. Marsh-Brown has played at a good standard. Sports have lost last season’s top scorer Mark Jones who will be travelling, and defender Ollie Medwynter who has retired. Talented forward Jordan Macleod is currently coaching in the United States and has yet to confirm a return date and goalkeeper Dan George is expected to return to Peterborough Northern Star. News: Leigh Porter is the new manager at the Abbey Lawns after a successful spell in charge of Deeping Under 18s. News: Successful under 18 managers John Carver and Franc D’Agnano will manage the reserve team in the Peterborough Premier Division. Signings: Tom Smith, Josh Ford, Jonny Clay, Jamie Stevens, Billy Smith. News: Rob Zirpolo replaces father Tony as club chairman. Malc Kenny is the new assistant to first-team manager Steve Wilson. News: Ryan Wood and Aaron Meadows to manager reserve team in Peterborough Premier Division. Signings: Paul Malone Jake Newman, Jordan Brown, Mitch Griffiths, Ronayne Marsh-Brown. News: Goalkeeper Dan Swan has joined St Neots. Signings: Alex Smith, Lee Beeson, Jordan Nuttell, Fraser Bayliss. News: Full-back Paul Walker has left the club. Signings: Leon Mattem, James Hugo, Tom Siddons. News: New arrival Cleveland Taylor has played for Grimsby, Scunthorpe, Exeter, Brentford and Burton. Signings: Jordan Cooke, Chris Salt, Taron Hare, Liam Adams, Cleveland Taylor. News: Goalkeeper Paul Bastock has finally retired. Signings: Sam Vince, Ryan Harnwell.